I'm back from a great week in the Stockholm archipelago. We were eight girls, of which five were knitting! 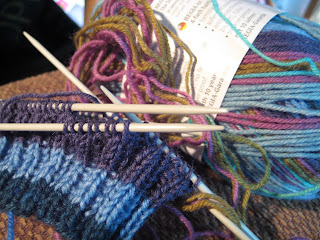 It was the knitting gals from this winters baby blanket project, and I'm so happy they got bitten by the yarn bug because it makes me seem less crazy. 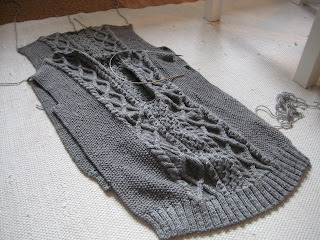 During the week in the archipelago I finally made some progress on the big aran sweater I'm knitting for myself and desperately hoping to finish in time for winter. As for now, outlook is good -back and almost front are finished. When I get past the sleeves I'm looking forward to knitting a ribbed collar big enough to double as a hat. SP12 is going great so far, even though I don't seem to get all the SP12 weekly questions mails. I've sent my first parcel and my spoilee was so happy it totally made my day. I've already started shopping for the next one, and it's so much fun! Melissa's great packages last year taught me that it's more fun to just buy the stuff you think your spoilee will like, rather than keeping track of keeping the $60 limit. I like your aran sweater and I am sure the socks are going to be great !